I know that nobody likes poetry except suicidal teens (and who cares about them if they're just going to kill themselves, am I right? ), yet I'm still going to post some poetry here on One Year in Texas because I can. If you have a problem with that then email me at jake@oneyearintexas.com. Let's duke it out. Did you know that was a street? Some of the best poetry I've ever read. Take that Shel Silverstein. Jake, I had no idea you had so much emotion bottled up. I'm glad you've finally found a way to express yourself. Jake please do not treat suicidal teens or poetry so callously! You could be responsible for either's death. I love these so much! I'm going to go write about them in my journal while wearing too much eyeliner and fighting with my parents. Thanks everybody! 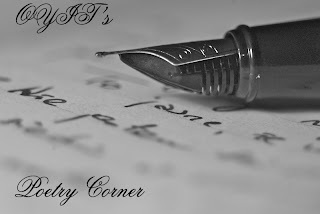 I'll do another poetry corner soon with some haikus.